This recipe is inspired by the meatballs found in Michael White’s new cookbook Classico E Moderno. I really recommend the cookbook–your house will end up smelling like Italy after every single dish. 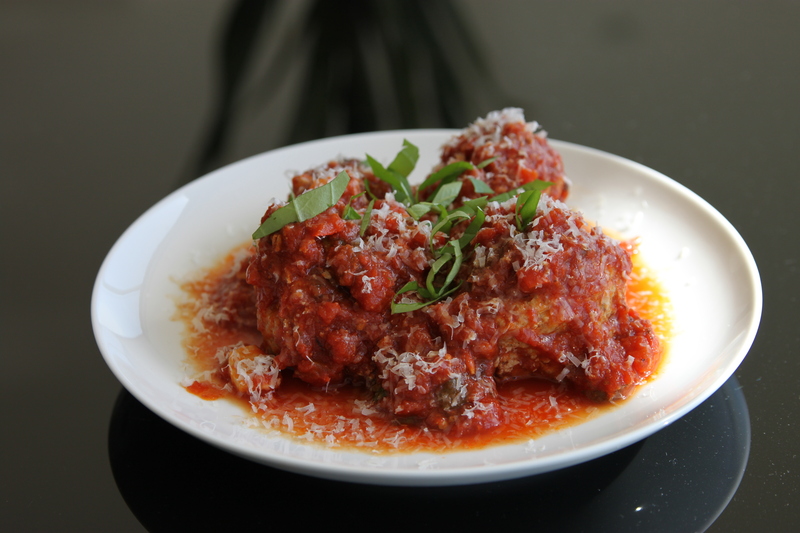 The meatballs are great–the use of the milky bread and eggs makes for a proper consistency. But, the sauce is the real star. The red bell pepper adds some acidity and the slightest bit of peppery flavor to the sauce; this is how the masters do it in Naples. I made some changes to the recipe so that it is easier for home cooks and based on readily available ingredients. Cook this down briefly before adding the canned tomatoes–this is where the flavor originates. And let your sauce simmer, the longer it does the better it will taste. Fresh basil is a must. The bread only needs to soak in whole milk for about ten minutes. Top with freshly grated Parmigiano and fresh Basil. 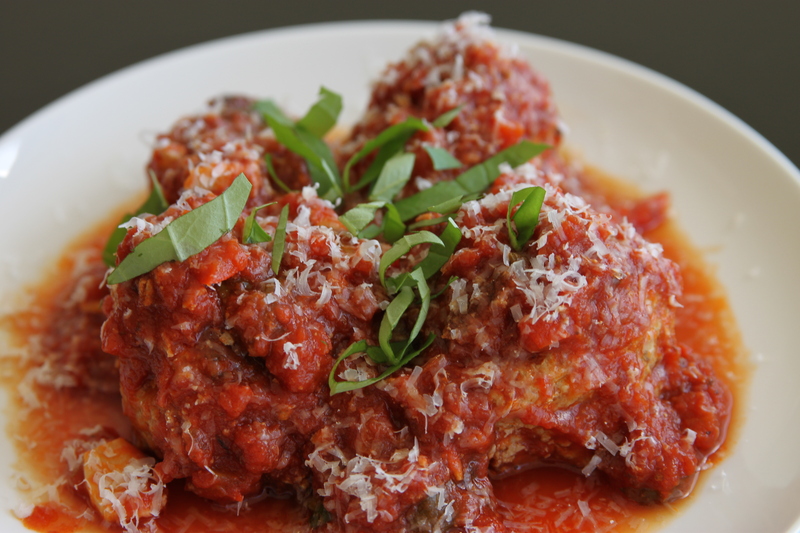 Three meatballs will most likely fill anyone up–four was my personal limit. You should aim for golf ball sized ones. Enjoy! The Prosciutto is not an absolute necessity, but it’s smokiness and saltiness is almost vital. 1) Remove fresh garlic cloves from bulb and lightly smash with the end of a chef’s knife. Wash, core and dice the red bell pepper. Wash and dry leaves of fresh basil. 2) Heat a medium sized saucepan over medium heat. Add 1 Tbsp. of olive oil. Once the oil is heated add smashed whole garlic cloves. Stir garlic for approximately 3 minutes until they begin to brown. Then add the diced red bell pepper. Stir vigorously, cook the peppers and garlic together for 3 minutes. 3) Pour in the canned tomatoes and stir to mix all ingredients. Then add the red bell pepper flakes, fresh ground pepper, a pinch of sea salt and stir. Then, add the bay leaves and stir. 4) Roughly chop the basil leaves. 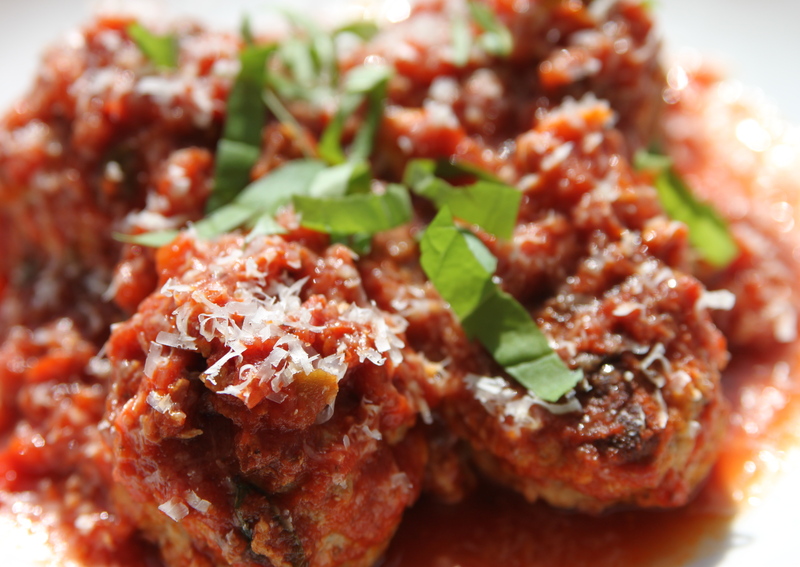 Don’t chop about 1/3 of the basil leaves–you will need them later to top the meatballs. Add chopped basil to the tomato sauce mixture and stir. Once the sauce mixture begins to simmer, turn the heat to low. 5) Cover the pot, leaving just a small area for the steam to escape, and cook for at least an hour on low heat. You want the sauce to thicken and for all the flavors to be released. You only need to stir every so often as long as you are truly using low heat. Once the sauce has simmered for at least an hour, place it to the side. The longer the better with this–I cooked mine for just over 2 hours. 6) Remove crust from bread. Then tear bread into small bite size pieces. Pour one cup of whole milk over the bread and let soak. Make sure all pieces are soaking up milk. Remove the bread from the milk after ten minutes and place in a large mixing bowl. 7) Lightly beat the eggs. Then, tear prosciutto into small pieces or use a knife to cut into small pieces. Add the ground pork shoulder, torn prosciutto, nutmeg, marjoram, dash of sea salt, fresh ground pepper and eggs to the mixing bowl holding the milky bread. Knead gently so that all ingredients are mixed in and incorporated. Cover with plastic wrap and refrigerate for 1 hour. 8) Remove the refrigerated pork mixture. Form ground pork into golf ball sized meatballs–you should make about 25 meatballs with this recipe. Place on a plate to the side. 9) Heat a large nonstick pan (I used a cast iron skillet) over medium-high heat. Add 1 Tbsp. of olive oil. Then, add the meatballs and cook. Turn occasionally letting the meat brown on all sides. This will take approximately ten minutes. Do not crowd the meatballs! If you do not have enough pan space, use two pans or cook in two batches. I did mine in two batches with a limited kitchen. 10) Once your meatballs are browned pour the tomato sauce into the pan. Reduce the heat to medium-low and simmer for approximately 20 minutes. You can cut into one to make sure it is cooked through. 11) Transfer to a large serving platter. Top with grated Parmigiano-Reggiano and freshly chopped basil leaves. This looks absolutely fantastic! I would love to taste them. They are quite different from our Sicilian ones, in the tomato sauce we use cinnamon, some sugar and also raisins.